Please note that this is an extended Amateur Radio Newsline and includes three breaks. Thank you. 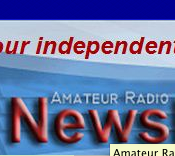 Amateur Radio Newsline report number 1891 with a release date of November 8th 2013 to follow in 5-4-3-2-1. The following is a QST. AMSAT North America celebrates 30 years of manned ham radio in space; all hams in New Zealand will soon have access to 6 meters; Oregon’s Office of Emergency Management says it needs more ham radio volunteers and the FCC acts to stop abuse of EAS alert tones. All this and more on Amateur Radio Newsline™ report number 1891 coming your way right now. The weekend gathering in Houston, Texas, marked AMSAT’s celebration of the 30th anniversary of amateur radio involvement in human space flight. It also told the story of its evolution into a successful program on board the International Space Station which is known as today as ARISS. These days there are about 100 ARISS school contacts made world-wide every year. There are also the experiments with Packet Radio, Fast Scan and Slow Scan television plus the casual operations from orbit by some licensed crew members. When added together you come away with a ham radio in space program that cannot be duplicated by any other all volunteer radio service. And now at age 30, manned ham radio in space is not only alive and vital, but through ARISS, it’s going strong. For the Amateur Radio Newsline, I’m Bill Pasternak, WA6ITF, in the newsroom in Los Angeles. Another part of the celebration was a panel presentation hosted by KA3HDO and included discussions with retired NASA Astronaut’s Owen Garriott, W5LFL, and Bill McArthur, KC5ACR. And less we forget, you can see and hear the complete interview with Frank Bauer, KA3HDO, and NASA’s Kelly Humphries on the web. It’s at tinyurl.com/thirty-years-in-space. The last Channel 1 Television transmitter in New Zealand is due to close down at the end of November. And now telecommunications regulator Radio Spectrum Management has announced that as of December 6th that hams throughout the nation will have access from 50 to 51 MHz without needing to apply for a permit. The actual allocation which is called a management right under which the channel 1 television transmitters operated does not expire until August 2015. Therefore 50 to 51 MHz can not appear on the Amateur General User Radio License until after this date. To get around this, Radio Spectrum Management is putting in place a footnote called license No 4122. It simply says that those who hold a New Zealand General Amateur Operators Certificate of Competency and a callsign issued pursuant to the Radiocommunications Regulations of 2001 may operate an amateur radio station under this new grant. The power limit will be 1 kilowatt to bring it into line with the power on the nations General User Radio License for Amateur Operators. When the actual Management Right expires on August 30th of 2015, 50 to 51 MHz will be added to the New Zealand General User Radio License for Amateur Operators. For the Amateur Radio Newsline I’m Jim Meachen, ZL2BHF, down-under in Nelson, New Zealand. A recent simulated emergency test in Oregon has pointed out a need for more ham radio communications volunteers in that state. The scenario of the event centered around the simulated hacking on the electric power grid that in turn cut off both telephone and internet access. As such the test planners had identified amateur radio as the fallback method of communication. While the exercise was considered a success, it also pointed out one of the current vulnerabilities. That being a lack of qualified amateur radio operators east of the Cascade Mountain range. While the state has about 700 licensed volunteer ham radio operators to help run the emergency communications system, most are in Western Oregon. Morrow, Grant and Jefferson counties have no volunteers. Other counties have as few as 1. So the bottom line is that more emergency communications trained amateur radio volunteers are needed in the eastern part of the state. And word from ARRL Awards Branch Manager Bill Moore NC1L, that several operations have been approved for DXCC credit. These are Yemen 2013 using the call 7-Oh-2-A and the 2012 and 2013 operations from Afghanistan as T-6-M-H. Also approved has been the current T-6-S-M Afghanistan operation that began on August 14, 2012. Time for you to identify your station. We are the Amateur Radio Newsline, heard on bulletin stations around the world including the W0ILO repeater serving Fargo, North Dakota. It doesn’t happen very often but the FCC has issued an official Citation and Order for violation of Section 15.5(b) of the Commission’s regulations governing what are called Incidental Radiators. In this case the recipient is Ronald Bethany doing business as Perfect Cuts Salon in San Antonio, Texas, who is being cited for operating incidental radiators and causing harmful interference to a cellular telephone system. This past July 24th the FCC’s Houston Office used direction finding techniques to locate the source of an unknown transmissions on 705 MHz to the Perfect Cuts Salon. The agent confirmed that the interfering signal was coming from the overhead fluorescent lighting in the salon. The agent then interviewed Bethany who is the owner of the salon. He reportedly stated that representatives of AT&T had conducted on and off testing of the lighting in the salon and confirmed that the interior fluorescent fixtures were the source of interference to a cell site located next door. Bethany further stated that he had unsuccessfully asked General Electric, the manufacturer of the fluorescent lighting, to replace the lighting. The FCC says that Bethany would not cooperate, so the agent from the Houston Office was unable to conduct his own on/off testing of the lighting in the salon. The agent verbally warned Bethany that he must repair or replace the lighting fixtures to resolve the interference. On July 31, the agent spoke by telephone with Bethany, who stated that the lighting was not causing him any problems and that he saw no reason to repair or replace them unless he was paid to do so. The agent reiterated to Bethany that he must resolve the interference or be in violation of the FCC’s rules. As of the October 25th release date of the Citation AT&T continues to report receiving interference at its cell site next door to Mr. Bethany’s salon. Now, based on the evidence it has on hand the FCC has found that Ronald Bethany is in violation Of Section 15.5(b) of its Rules by operating incidental radiators and causing harmful interference. It has directed him to cease operation of the incidental radiators immediately. Or in simpler terms, it basically told him to turn off the lights until the interference can be resolved. From near Houstron Texas, I’m Skeeter Nash, N5ASH. Responding to a growing number of consumer complaints that TV and radio commercials are misusing the Emergency Alert System or E-A-S sounds the FCC’s Enforcement Bureau has taken action to stop the practice immediately. This is according to Robert H. Ratcliffe who is the Acting Chief of the FCC’s Enforcement Bureau. In a press statement, Ratcliffe said that it is inexcusable to trivialize the sounds specifically used to notify viewers of the dangers of an incoming tornado or to alert them to be on the lookout for a kidnapped child, merely to advertise a talk show or a clothing store. This activity not only undermines the very purpose of a unique set of emergency alert signals, but is a clear violation of the law. Caught by FCC Enforcement is Turner Broadcasting. It has been issued a $25,000 Notice of Apparent Liability for using simulated E-A-S tones to promote its Conan O’Brian Show. The FCC also reached a resolution with MMK License LLC which owns WNKY – DT in Bowling Green, Kentucky. In that case the complaint alleged misuse of a simulated EAS Attention Signal in an advertisement for “The Fan Wear and More Store.” Settling that case cost MMK a $39,000 voluntary contribution to the U.S. Treasury in the form of a Consent Decree. The FCC has fined Glenn S. Yamada, of Kenai, Alaska, $500 for what the agency terms as his willful and repeated operation of a non certificated Class D CB transmitter and a linear amplifier. This in direct violation of its Part 95 Citizens Radio Service rules. On July 18, 2012, the Enforcement Bureau’s Anchorage Resident Agent Office issued a Notice of Apparent Liability in the amount of $12,500 to Yamada for operating a non-certificated CB transmitter with a radio frequency linear amplifier which voided his authority to operate his CB station. In response to that notice, Yamada did not deny the violations, but stated that he had not intend to violate the Communications Act or the FCC Rules and that he is unable to pay that high an amount. He also provided the necessary documentation to prove his claim. The FCC affirmed an earlier decision to fine Hong Kong based Richfield Electronics $18,000 for marketing wireless radio gear in the United States that does not comply with its technical and labeling requirements. Richfield received FCC certification for its 106.7 to 107.9 Whole House FM Transmitter in 2002, but later modified it to improve sound quality. The modification made it noncompliant with the FCC’s rules. The Enforcement Bureau originally proposed the penalty in 2009. In its response to the proposed fine, Richfield told the FCC it didn’t know exactly how many of the noncompliant devices the company had shipped to the United States, but conceded it had shipped at least 2,500 transmitters that had the modified antenna. The FCC believes the number of noncompliant devices made and sold was significantly higher than Richfield acknowledges. Richfield asked for the fine to be cancelled, alleging that TAW asked Richfield to make the devices based on that company’s designs and therefore TAW and not Richfield was responsible for violating the FCC’s rules. However the commission says Richfield did manufacturer and market unauthorized FM transmitters in the U.S. The FCC revitalization plan has many facets. The proposed translator filing window would allow AM stations one chance at a single FM translator within the stations AM daytime signal coverage contour. It would be permanently linked to the AM so that it may only be sold or transferred with the underlying AM license and not by itself. The change in community of license coverage would reduce the requirement from 100% daytime and 80% nightime to 50% daytime and night coverage within the 60 dBu contour. This is the same as it is for noncommercial educational FM stations. The proposal would also do away with the so-called “ratchet rule.” This is the nighttime skywave protection requirement that result in new stations or those moving their transmitter sites having to reduce power or go directional and thereby reducing their nighttime coverage. It would also alter the minimum efficiency standard for AM antennas by reducing the existing minimum effective field strength values. The notice also opens the door for new proposals to help AM stations that include the use of modulation dependent carrier level control. This is a system similar to the old controlled carrier AM techniques used by hams back in the 1950’s and 1960’s. It’s a system where carrier level increases with modulation level, but now on a far more technically advanced level than was available in the old days of ham radio. Experiments have shown a significant reduction in energy costs with no loss in intelligibility or area of coverage using this modulation technique. For the Amateur Radio Newsline, I’m Bruce Tennant, K6PZW, in Los Angeles. Newly confirmed FCC Chairman Tom Wheeler has announced several staff and other appointments. Ruth Milkman will be his chief of staff. She is currently Chief of the FCC’s Wireless Telecommunications Bureau and has worked as special counsel to the chairman for innovation in government. She’s former deputy chief of the International and Common Carrier Bureaus and was senior legal advisor to Chairman Reed Hundt. Philip Verveer has been named senior counselor to the Chairman. He is former United States coordinator for international communications and information policy at the State Department, and practiced communications and antitrust law for 35 years. At the FCC he was chief of the Cable Television Bureau, the Broadcast Bureau and the Common Carrier Bureau. Gigi B. Sohn joins as Wheeler’s special counsel for external affairs. Since 2001 she has been president and CEO of Public Knowledge, an “open Internet” advocacy organization. More recently co-chair of the board of directors of the Broadband Internet Technical Advisory Group. Diane Cornell was named the chairman’s special counsel. She was Vice President for government affairs at Inmarsat and also the Vice President of regulatory policy at CTIA, The Wireless Association. Her FCC background includes working as a legal advisor to three commissioners, chief of staff of the Wireless Telecommunications Bureau and division chief in the International and Common Carrier Bureaus. Others include Daniel Alvarezwho was named a legal advisor to the chairman, Deborah Ridley who was named confidential assistant to the chairman, and Sagar Doshi as special assistant. The Quarter Century Wireless Association’s Board of Directors has announced the appointment of John Johnston, W3BE, to fill the Director vacancy of Val Erwin, W5PUT. Johnston has been licensed for 59 years and resides in Derwood, Maryland He is a Life Member of the QCWA, and a member of QCWA Chapters 20, 91, 45 and 222. Johnston is a past QCWA Director, Vice-President and President. He is also the contributing editor of ‘The Rules & Regs Digest’ for the QCWA Journal. First is a claim that the SiriusXM’s web player is notoriously unreliable, causing a loss of subscribers and a degraded listening experience for those who remain listening online. Second is that for a “caller driven” show, the caller pool is just too small and lastly that international listeners have no legitimate way to hear the show. According to siriusbuzz.com, Bell will continue his show on the web. As of late on November 6th he was already testing at http://live.artbell.com:8303/stream. Actual terrestrial signals interfering with weak satellite signals. Serving you 52 weeks a year, every year since the mid 1970’s, we are the Amateur Radio Newsline with links to the world from our only official website at www.arnewsline.org and we will be right back. Developed in the United States by the company Nanostim, the tiny device is less than 10% of the size of a conventional pacemaker, uses a built-in battery and is designed to be implanted intravenously directly in the heart. Conventional pacemakers require a patient be subject to a surgical procedure so that a pocket can be created in the body to house the pacemaker and associated wiring. Such wires are regarded as the component of pacemakers most likely to fail. By contrast the Nanostim pacemaker is inserted via a catheter inserted through a vein leading to the heart. It has a built-in battery that is expected to last between nine and thirteen years. Eliminating the need for wires lowers the risk of infection or malfunction and means that patients are not restricted in the amount of activity they do, the firm behind the device claims. Currently more than four million people around the world have some sort of cardiac rhythm device with an additional 700,000 people getting one each year. The new pacemaker design has yet to receive full United States Food and Drug Administration approval. For the Amateur Radio Newsline, I’m, Heather Embee, KB3TZD, in Berwick, Pennsylvania. More on this story is on the web at tinyurl.com/wireless-pacemaker. Intel’s Galileo open-source computer can now be ordered and is scheduled to ship at the end of November. Online retailer Mouser Electronics is the first to take orders for the board. The Galileo computer is an unenclosed circuit board that’s a little larger than a credit card, and uses Intel’s extremely low-power Quark processor. ON THE AIR: ARECIBO OBSERVATORY ON-THE-AIR THIS SUNDAY NOVEMBER 10. If you are hearing this before Sunday, November 10th, then listen out on 20 meters for station KP4AO. This as part of the celebration of the 50th anniversary of the Arecibo Observatory in Puerto Rico. F4FET will be active stroke as 3A from Monaco on November 11th and 12th. His operation will be on 40through 10 meters using SSB. QSL via his home callsign, direct or via the bureau. IK7JWX has informed the Ohio Penn DX Newsletter that his DXpedition to the Island of Zanzibar scheduled for April of 2014 is has been cancelled. The reasons given are technical and logistical constraints. EA4ATI says that he will be in Kenya for a couple more years and will be active stroke 5Z4. He is using a Cobwebb antenna with a small amplifier and is active on 30/20/17/15/10 meters. His QSL Manager is EA4YK. JA8BMK will be operational as 9N7BM from Kathmandu and Nagalkot in Nepal between November 8th and the 28th. Activity will be holiday style on all HF bands and he says that he will try to work the United States on 160 and 80 meters if vertical antennas can be put up. QSL via JA8BMK, direct or via the bureau. Lastly, 8P9IU, 8P9TA and 8P9BJ will be on the air from Barbados between December 9th and the 16th. Their main activity will be the ARRL 10 meter Contest on December 14th and 15th using the call 8P8T. Prior to the contest, operators will be using their own callsigns. QSL via KI1U. Under a new set of new FAA guidelines passengers on domestic U.S. flights will be permitted to read, work and listen to music from gate to gate. But they still will not be permitted to talk on their cellphones, directly browse the Internet or use any form of two-way radio through the flight. Internet connectivity will only be permitted on aircraft equipped to provide such a service, usually at a fee. For ham radio operators it means the ban on the use of a hand-helds or other gear operating on any band will continue just as the rules are now. Currently airline passengers are required to turn off their smartphones, laptops, and other devices once a plane’s door closes. They’re not supposed to use them again until the planes reach 10,000 feet and the captain gives the go-ahead. Passengers are then supposed to turn their devices off again as the plane descends through 10,000 feet to land and not restart them until it is on the ground or at the arrival gate. Under the new guidelines, airlines whose planes are properly shielded from electronic interference may allow passengers to use the devices during takeoffs, landings and taxiing. The FAA says that most new airliners and other planes that have been modified so that passengers can use airline supplied WiFi at higher altitudes are expected to meet the criteria. However to use electronics that normally radiate an RF signal, that feature must be disabled unless instructed otherwise on aircraft with airline supplied WiFi connectivity. For the Amateur Radio Newsline, I’m Stephen Kinford, N8WB, in Wadsworth, Ohio. For now, with Bill Pasternak, WA6ITF, at the editors’ desk, I’m Don Wilbanks, AE5DW, in Southern Mississippi, saying 73 and we thank you for listening. Amateur Radio Newsline™ is Copyright 2013. All rights reserved.